The Hitchhiker satellites were prototype satellites in the P-11 program, which served scientific purposes. Later P-11 satellites were built as classified SIGINT subsatellites. These subsatellites were deployed from the propulsion rack of the Agena-D stage of KH-4 Corona, KH-6 Lanyard and KH-7 Gambit-1 reconnaissance satellites. 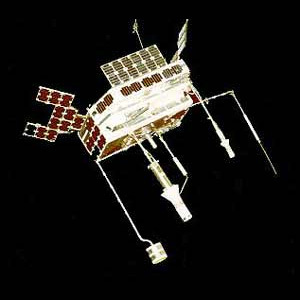 Hitchhiker 2 was a polar-orbiting Air Force scientific satellite that carried six experiments. Instrumentation on board included spectrometers and Geiger tubes to measure electrons and protons in various energy ranges (both directional and omnidirectional experiments), a Faraday cup, a VLF experiment, and a magnetometer. The spacecraft spin axis was approximately aligned with the earth's spin axis. Telemetry consisted of two tape-recorded and two real-time data channels. Each of two commutators had one real-time and one tape-recorded channel. Two weeks after launch one of the commutators temporarily stopped and thereafter operated intermittently. Four weeks later, the tape-recorded channel on the other commutator failed. On 1 September 1965, the tape recorder failed, and very little scientific data were obtained after that date. The satellites were based on Lockheed's P-11 bus, which was designed to fit on the aft rack of the Agena-D upper stage. The bus contained each one or two focused payload black boxes and different antenna configurations according to payload, as well as deployable solar arrays. The satellite featured two solid rocket motors, which allowed them to rise and circularize their orbit after deployment from the host satellite. Both spin or gravity gradient stabilization was possible.